If you want full, quality sound from your vehicle audio system, adding a subwoofer (Source) will give you some of the bass that’s missing — but space inside your vehicle is limited. Under-seat subwoofers are a great solution. 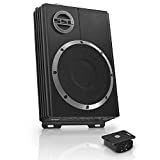 The power capabilities of most under-seat subwoofers (Source) are much smaller than that of their larger contenders, but they’re designed for a smaller, enclosed space, not for breaking the windows. They also accommodate use in compact or sports cars, as well as in larger vehicles. Because of their size, they cost less, and their weight, even with an under-seat subwoofer box, isn’t going to result in paying more at the pump. To help you decide on the right under-seat subwoofer for your vehicle, here’s our list of the top five picks. If you’re looking for a slim subwoofer that you can easily fit under the seat of your sports car, the Rockville RW10CA is the right model for you. 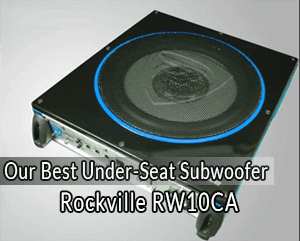 This subwoofer is only 10 inches wide and 2.7 inches thick, so it will fit nicely under most car seats.The Rockville RW10CA is capable of producing 800 watts of peak power and up to 200 watts RMS. The clear and crisp sound that this subwoofer produces is one of the main reasons for its popularity. This model is CEA-2006 compliant which means the ratings are approved by a 3rd party, so you can rest assured that this item will produce the power it says it will.This is one of the few slim under-seat subs on the market that are CEA compliant. If you are not happy with the sound quality, or the subwoofer’s performance, the manufacturer promises to take it back within 30 days of reception date and fully refund you. 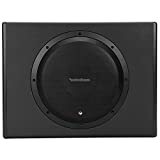 One of the best things about this particular model of under-seat subwoofer is that it is really easy to install.This unit is designed with the user in mind from start to finish. It has high level inputs, so you don’t need a remote wire from your receiver to trigger the unit on and off. The smart circuit will sense that an audio signal is present and turn on your radio. When you turn off your music signal the amplifier built into this subwoofer system will automatically turn itself off. Using the high-level input is also the fastest and easiest way to install an aftermarket amp subwoofer combination since you do not have to remove the receiver. You simply use the high-level input and wire it to your speakers. All the inputs and outputs are on one side. This makes wiring neater and easier. Full Sound Control. This model also has amazing controls so you can tweak the sound to your liking. It has a level control for the volume, a subsonic filter to filter out the really low frequencies that the human ear cannot hear, a low pass crossover filter, phase control, and bass boost. Whether you have previous experience with aftermarket subwoofers or not, we can all appreciate a model that’s easy to install. The Kicker 11HS8 comes with a plug-and-play installation, so you can easily hook it up to your vehicle’s sound system. The Kicker 11HS8 is just over 3 inches thick and 14 inches wide, so it will fit under most car seats without sticking out. The subwoofer is 8 inches wide, and it generates 150 watts of RMS power. One of the major advantages this subwoofer has over its competitors is the ease of installation. This model comes with Velcro nylon straps for a fast installation and a quick-connect power plug. Ford owner say that The Hideaway is the best cheap audio upgrade you can do to the stock F150 system. Its output is surprising. The unit itself is much heavier than you’d imagine, but the various install options make it an easy addition to most vehicles. 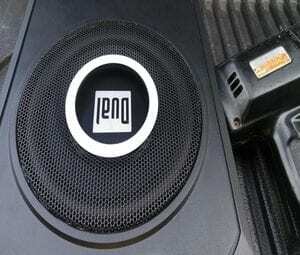 The PWE-S8 by Alpine is an easy way to add powerful bass to your vehicle’s sound system. It features a powered 8-inch subwoofer paired with a built-in amplifier, housed together in a cast aluminum enclosure. This model is 13.5 inches long, 9 inches wide and measures 3 inches at its tallest point, so you can add low, punchy, accurate bass to your sound system without taking up much space in your vehicle. The compact shallow mount design gives you the flexibility to install the PWE-S8 under or behind the seat of your truck, in the trunk of your sedan, in the hatch of your SUV, or it can be tucked in any other compact space. The die-cast aluminum construction provides durability for ongoing performance. The amplifier produces 120W continuous power and the quad-coil subwoofer delivers 32Hz-150Hz frequency response. Its max power output is 240 Watts. The PWE-S8 easily connects to your sound system through the RCA or Auto-sensing Speaker Level Inputs, which are conveniently located on the side panel. The side panel also gives you access to Phase, Gain, LP Crossover and Remote Sub Level controls for proper sound setup and greater flexibility during installation. For professional installation, visit the store locator on the Alpine USA website to find an authorized Alpine retailer near you. If you’ve been involved in the aftermarket sound systems market in the last decade or so, you’ve surely heard about Rockford. Rockford is one of the leading manufacturers in this market, and their models still continue to amaze. This isn’t exactly an under-seat, unless you are a desperate adrenaline junkie. The Rockford Fosgate P300 will literary blow you out of the seat, as it generates 300 watts RMS, making it one of the most powerful models available on the market. This model has a closed loop design which will provide the optimal performance between the amplifier, the subwoofer, and the enclosure. The hard casing protects the subwoofer against bumps and scrapes. If you need to quickly add bass to a system or want to alleviate the hassle of separate amplifiers and subwoofers, then the P300-12 is the right one for the job! The P300-12 features a Punch 12-inch subwoofer in a custom sealed enclosure and is powered by a mighty 300-Watt amplifier. The system is all-inclusive, so you only need to run power, ground and a signal from the source to get this baby moving. It features a durable exterior that resists scrapes and bumps while in the trunk or cargo area. SSL LOPRO8 is definitely the less expensive amplified subwoofer we’ve come across, which is a great option for anyone looking for a solid car amplified subwoofer that doesn’t break the bank. This is a very well-made and affordable subwoofer that carries a huge return on investment. The LOPRO8 combines a built-in amplifier and an 8-inch subwoofer in a super-compact ported enclosure. It comes with various tuning controls to adjust your bass and give your music the extra punch it needs. The amount of bass it can deliver is impressive given the fact that it lacks venting ports. It is equipped with RCA low and high-level inputs and a remote bass level control, not to mention low pass and subsonic filters as well as soft-delay remote turn on. If you want a deeper bass, a higher power handling by the under-seat woofer is preferred. The subwoofer needs to have enough power to convert electrical energy to sound energy. The higher the power rating, the more energy it can potentially transform into sound. Almost all under seat subwoofers for cars come with a pre-built amplifier. Most class D amplifiers should be efficient and powerful enough to handle an under-seat subwoofer. Additionally, take note of the power rating of the amplifier. The higher the better, of course as it will play louder. The cone inside the subwoofer is the part that displaces air to produce the bass sound. The larger the cone, the more air it will displace. Therefore, choose a model with a bigger cone if you want a deeper and more powerful bass. As an example, a 12-inches model will always produce a more powerful bass than an 8-inches model, no matter how good the 8-inches sound. A subwoofer that is more sensitive will require less electrical energy to move the cone and produce a sound. Therefore, such a woofer is considered to be more power efficient than other models. Moreover, since it consumes less, it will also last longer since the components will heat less and are more durable over time. If you want a clean install and do not want audio wires to be visible, then you must use thin wires for the connections. However, only subwoofers with a low impedance will accept thin wires. For discreet installations, a 2 Ohms subwoofer is always better than a higher impedance model. The resonant frequency is the minimum frequency the subwoofer can respond before it distorts. Lower is better in this case. Especially since an under-seat subwoofer will be in a confined space where it is more prone to distortions. A lower resonant frequency should help massively in producing a clearer and cleaner sound. The specifications will be the determining factor of how well the subwoofer will perform and the quality sound. The RMS power is actually the total amount of continuous power a subwoofer can handle. In fact, the RMS is the most accurate measurement of the subwoofer’s power. As the RMS power handling increases, so will the loudness capability. It is important to note that it’s better to overpower than under-power any type of speaker. The powered subwoofer is similar to the enclosed subwoofer. Except that it includes an amplifier along with the subwoofer, which is stored inside of an enclosure. These typically do not take up very much space, but most people tend to install them in the trunk or in the floor behind the driver’s seat. Many people decide to upgrade their car audio system at some point, because the system no longer performs adequately or they are just desire an improvement. This process should not be rushed, since there are so many different factors to take into consideration. The under-seat subwoofer is the major component of an audio speaker, so it is crucial to choose carefully. All of the under-seat subwoofers reviewed above are top-quality products that are absolutely safe to use. 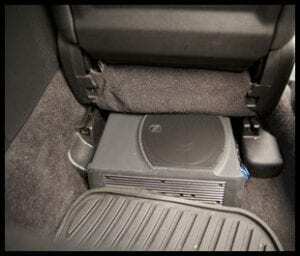 However, we do recommend that you have your under-seat subwoofer installed by a car audio specialist, to avoid short-circuiting and other malfunctions. Thank you so much for reading our review on the top five under-seat subwoofers currently available on the market! Happy shopping! 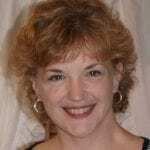 With nearly 20 years of experience as a Technology writer and editor, Bernadette has worked with various large cap and mid-sized brands in the IT and Tech industry. Bernadette also writes content at VARinsights, a leader for IT news & trends. To get in touch, check out her LinkedIn profile.